Our Cappella bouncer gives your little one a comfortable and interactive space that's suitable from birth. Available in our Moon and Clouds design. 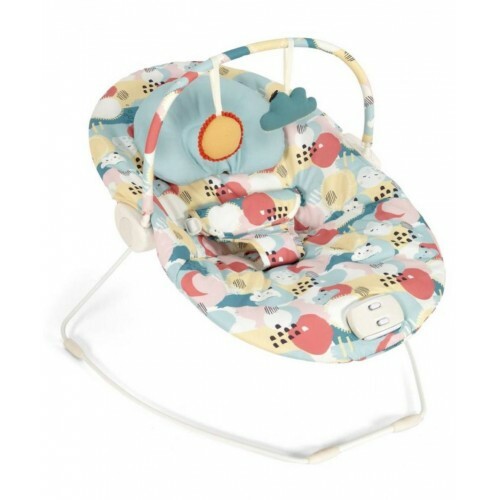 Gentle rocking motions, melodies and interactive toys make this bouncing cradle perfect for both relaxation and playtime. A padded seat insert keeps baby snug and cosy in their bouncer chair ? remove the insert as they grow to give them a little extra room. A soft bouncing motion is activated under the baby's weight, and a vibration function offers a gentle soothing motion to encourage sleep. The baby bouncer chair has 3 interactive toys to add hands-on fun for your little one. Remove the toy bar for a more relaxed rest. Choose from 4 melodies to create a peaceful atmosphere with this bouncer for baby. Bouncing cradle measures H:57cm x W:55cm x D:72cm approx.